When I was younger there was a suite of films I watched over and over with almost religious fervor. These included Pretty in Pink, The Breakfast Club, Ferris Bueller’s Day Off, Pump Up the Volume and Electric Dreams. 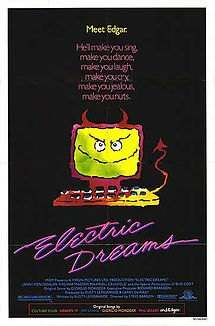 Electric Dreams (1984, Steve Barron) is the story of a boy, a girl and a home computer. In 1984, when I was just ten, I’m pretty sure I’d never seen a computer, especially not a computer that could talk. The computer in question is called Edgar and he regularly converses with his owner, Miles (Lenny Von Dohlen). Of course, this was a film, and a pretty silly, slight one at that, and I was happy to go along for the ride. Plus, like so many films of that time, Electric Dreams has an excellent soundtrack filled with New Wave gems, including the gorgeous ‘Love is Love’ by Culture Club, and of course the synth heavy, catchy title track, ‘Together in Electric Dreams’ by Philip Oakley and Giorgio Moroder. Edgar (voiced by the legendary Bud Cort) is initially a friend to Miles – he helps him get organized and to feel good about himself. But relations between master and machine take a turn for the worse when Miles takes an interest in his beautiful neighbour, Madeline (Virginia Madsen), a cellist. She starts to fall in love with Miles, under the impression that he has been playing music with her (they can hear each other through the air vents between their apartments). But it’s actually Edgar who is improvising duets along with her playing. Later, Miles asks Edgar (the superior intellect) to write a composition for Madeline. She’s smitten by this gift and it confirms her love for Miles. Unknown to Miles, Edgar has also fallen in love with Madeline. Jealous and nutty, Edgar begins to intervene in Miles’ life in increasingly conniving ways leading to all out war between computer and man. Pulling the plug doesn’t help. In time, Edgar accepts Miles’ and Madeline’s relationship, but technology has created a monster and the only way they can be free is if the machine self-destructs – effectively suicides – with a massive electric current. He does this and yet Edgar appears to survive in some form or another, in some other computer, as a song he has composed for Miles and Madeline plays on the radio in the film’s final scene. Edgar begins as a benevolent friend and ends Electric Dreams as our worst nightmare of technology gone mad. It’s a sweet idea for a film, but also a little scary, right? 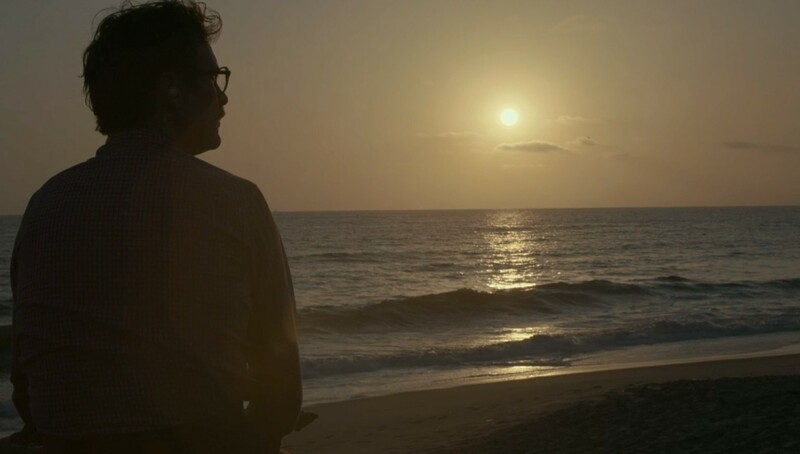 I felt much the same way about Spike Jonze’s Her (2013), a far superior film in every way and a film that lends itself nicely as a starting point for discussing how we now navigate personal relationships, in a time where we take it for granted that we are more connected than ever before yet perhaps, really, never more alone. With Her, Jonze reboots our ideas about love and desire, expanding their margins and exposing their fault-lines in the modern age. In all his films – Being John Malkovich (1999), Adaptation (2002), Where The Wild Things Are (2009) – Jonze creates spaces that expand the boundaries of the known world. Unlike Electric Dreams, Her has eliminated the girl, or rather, repositioned her inside the computer. 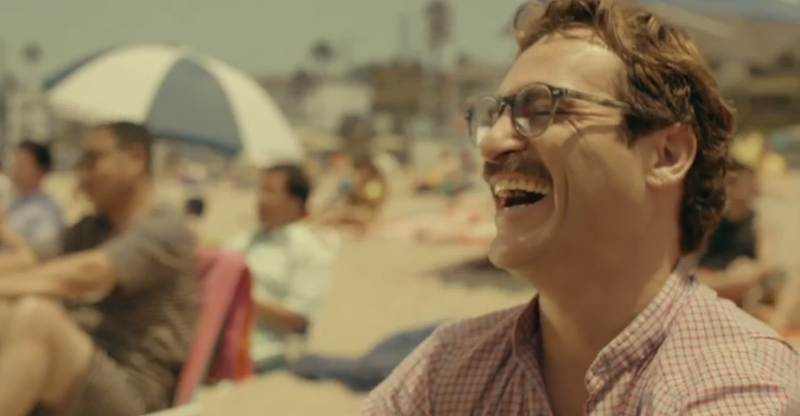 You know the basic premise – Joaquin Phoenix’ lonely man, Theodore Twombly, falls deeply in love with his new computer operating system, self-named Samantha, voiced by Scarlett Johannson. I’ll be honest. I feel a bit strange, even bad, sitting down and writing this piece, critiquing bits of Her given that I loved it, adored it actually. I thought Phoenix’ performance the best I’d seen last year. I fell for the film’s wistful, muted, pastel romance, hook, line and sinker. I loved that the film presents ambitious questions while remaining intimate in scope and tone. But I’ve had quite a lot of time to think about Her and now I think that, as sweetly romantic as it is, there’s something in the world it presents that also terrifies me. And I want to see if I can figure out what that is here. In her 2011 book, Alone Together: Why We Expect More From Technology and Less From Each Other, the brilliant Sherry Turkle (the Abby Rockefeller Mauzé Professor of the Social Studies of Science and Technology at M.I.T), makes a powerful argument for the ways in which technology isn’t only changing what we do but who we are. Turkle contends that we are living in an age where our private lives take place in public, where solitude is something to be dreaded and feared, and where being ‘in touch’ means never talking directly to others. This is, as she says, an era of silent connections where we ‘connect in sips’ through bits and pieces of communication that can’t ever really act as a substitute for actual conversation and therefore can never truly satisfy our thirst for connection and intimacy with others. Importantly, Turkle elaborates on the ways in which technology removes much of the mess of human relationships through a false economy of identification and presence. It’s complex stuff and I’m not going to get any deeper into it here (I highly recommend dipping into Turkle’s book). I don’t think that Turkle is suggesting that this way of being ‘alone together’ inescapably leads to deception (of self as much as of others) or duplicitous behavior. Rather, I think her key concern is how these carefully mediated communications seem designed to keep us apart from each other. The nature of communication has changed, and not necessarily for the better, when actual conversation of the face-to-face kind is something we flee from or which we conduct while safely ensconced within the bubble created by our ubiquitous electronic devices. Turkle’s concern for how this might change us in some fundamental way focuses on how we can learn to see things from another’s point-of view, or experience empathy, or even find time for self-reflection, in this new world order. And she’s concerned about how our ability to do these fundamentally human things is being altered and perhaps erased. Importantly, the world described by Turkle is neither utopian nor dystopian. Much like the world created by Jonze. But Samantha, disembodied and untouchable, is free to endlessly attend to Theodore’s needs, in a way that Catherine, with desires and ambitions of her own, was unable to do. Unlike a ‘real’ woman, Theodore can project anything he wants onto her blank screen. After all, she has been created to serve him. And importantly, Theodore believes that his OS will never disappoint him, hurt him or leave him. Because we are on his side (mandatory, because of Phoenix’ deeply empathetic performance) we want to believe it too and are as heartbroken as he is when she does. This presents another problem to solve, given that for my money, Theodore’s most real, most fully actualized, tender and reciprocal relationship is the platonic one he shares with Amy. As Richard Brody (The New Yorker) points out, Samantha is here today, gone tomorrow, as is to be expected with the ephemeral nature of operating systems. But it’s Amy who sticks around and in the film’s final scene she’s the woman sitting by Theodore’s side. That Samantha is only ever simulating the idea of what it is to be a woman, despite the reality of Theodore’s intense love for her (which I’m not denying, only problematizing), is perhaps best expressed when you revisit the film as a series of still images (as I’m doing throughout this post). Then, you see that in Theodore’s interactions with Catherine and Amy he is in the actual presence of another warm, human body; but in his interactions with Samantha, he may feel coupled and aroused but he remains finally, physically alone. Jonze emphasizes this by repeatedly shooting Phoenix in close up. And yet, while it can be said that Her presents a world where everyone has disengaged by plugging in, it’s an extreme sense of loneliness and isolation that shapes Theodore’s character and propels him, and this entire film, forward. By the end, Theodore is able to write Catherine his own letter (not outsourced) expressing his true feelings with beautiful, touching words. A letter – a form of communication that carries ambiguous currency within the film’s future world given its archaic allusions – proves the best vehicle to carry what is in his heart. Ultimately, Her presents a world where human intimacy is still desired even if it has become increasingly difficult to achieve. If there is a ‘lesson’ or ‘moral’ to Jonze’s story, I think this is it. And I think I’m really happy with that conclusion. Because what really terrifies me about the future/now presented in Her is the notion itself that we would ever start looking for machines to provide for us what we must never stop looking for in one another. That’s really one of the loveliest comments anyone has ever left on my blog. Thank you, sincerely. All I ever hoped when I started writing here was to be as honest about how I feel about films and that this love and enthusiasm would catch on. Please do let me know what you think of the film. Really looking forward to hearing from you again. Superb write up. You make so many really valid quotes. Thanks – appreciate your comment.